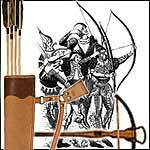 Historic and Fantasy Arrow Shafts for period archery, including Roman, Medieval, and Native American Style Arrows. Medieval Crossbow bolts for target shooting and Crossbow accessories like our quality top grain Leather Crossbow Quivers. Crossbows have been in use since the Roman times. Our selection of Medieval Crossbows are hand made by professional craftsmen. These wooden Crossbows are Great for target shooting, archery displays or medieval re-enactments.